For many years after Oberlin College was founded in 1833, students were required to attend chapel services. Flash forward to October 16, 2013, and chapel attendance was mandatory for a very different reason. ICE violinist (and Oberlin professor) David Bowlin spun quietly compelling webs of sound in Fairchild Chapel with his exquisite performance of Salvatore Sciarrino’s Six Caprices for solo violin. Sciarrino, an Italian composer born in 1947, is largely self-taught and has taken great pride in forging his own personal forms of musical expression. The Six Caprices, completed in 1976, stand as an iconic achievement. Sciarrino’s solo violin pieces were inspired by Nicolai Paganini’s 24 Caprices from 1819. But where Paganini’s work calls for bravura strutting, Sciarrino’s is full of hushed restraint, employing his unique tonal palette built entirely of string harmonics. 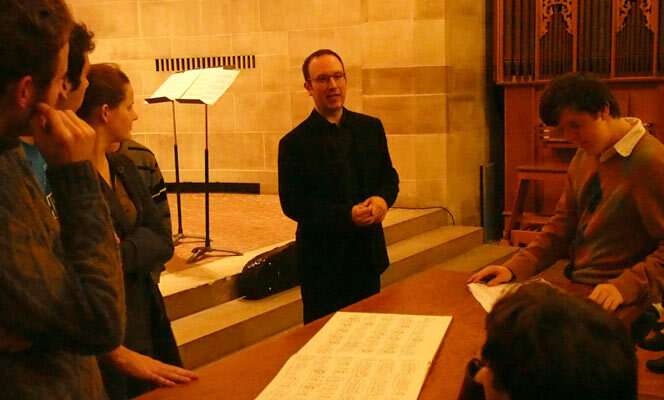 In David’s hands, each of Sciarrino’s Caprices wafted in mysterious sonic worlds. In “I. Vivace” David gently rocked the bow, his left hand jut barely caressing the strings along the fingerboard and all the way down adjacent to the bow, giving hints and suggestions that we were hearing this music through or under water. Long, slow draws of the bow characterized “II. Andante” as David produced tremolo harmonics with an incredibly light left hand. The lush, sensually faint high melody conjured the breathing of a sleeping loved-one on a silvery moonlit night with a breeze blowing in the trees. Muffled brazen shrieks rustled the air in “III. Assai agitato,” as David swirled the bow in wild elliptical dancing gestures across the surface of the strings. The visually arresting technique was matched by a hypnotic circular melody full of hairpin turns, running up, down, and around. The sounds in “IV. Voluble” alternated between the slightest hush and muffled roars with David displaying the intense effort needed to refrain from standard playing. Long sweeping squalls of sound filled the resonant chapel holding the audience in rapt attention. With the fundamental tones subtracted, only the shadings of color remained. “V. Presto” was very melodic in a ghostly manner. Some thick membrane obscured full hearing of the narrative journey the music had to tell. In “VI. Con brio,” David’s left hand flitted lightly along the strings above the fingerboard, tapping out a barely perceptible melody. Standard left hand pizzicato would sound like an elephant stampede in comparison. The finale is the longest of the Six Caprices and revisits all of the techniques employed in the first five. David left its icy crystalline music hanging in frozen air for all to contemplate. The Sciarrino Caprices are an extraordinary test of a violinist's endurance and focus. We’ve never seen a musician working so intently at being subdued and delicate as David was this night. It was breathtaking beauty to behold.